Leading Manufacturer of industrial power control panel from Ahmedabad. 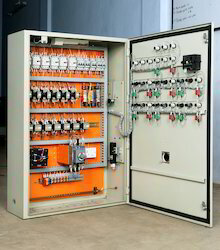 We offer a wide assortment of Industrial Power Control Panels to our clients. This is made of best quality of raw material. This is used for distribute the electricity for different types of industries. It consumes low energy. It is very durable, reliable and acclaimed for its high efficiency. Grid breaker and trips DG breakers are automatically worked. It also has AC motor. This product has voltage and frequency in exact proportion. These products are fitted with air calculation devices. Looking for Industrial Power Control Panels ?